"But he caught my eye at least when staying on nicely from the last - and maybe he raced on the wrong part of the track throughout there, given the winner came wide - and the big step up to 3m, with more cut in the ground, is well worth trying." It's pretty disappointing to see the ITV4 races at Newbury on Friday cut up a bit, especially now that the rain has come, but the 3m handicap hurdle at 15:35 has attracted 12 runners and that is where my sole punt of the day resides. You clearly have to be very worried about the ex-French 5yo Dragon D'Estruval and Aux Ptits Soins, making his debut for Dan Skelton off a mark of just 141 - and Juge Et Parti is 8lb well-in after his Chepstow second last week, so it was very surprising to see him initially put in at 16/1 by one bookmaker early on Thursday afternoon - but Rockpoint is my bet in the race. I thought he ran a curious race over 2m at Cheltenham on his reappearance. He travelled well on the inner throughout and his jockey, who keeps the ride here, didn't get overly-animated when the leaders started pulling away from him at the third-last. But he caught my eye at least when staying on nicely from the last - and maybe he raced on the wrong part of the track throughout there, given the winner came wide - and the big step up to 3m, with more cut in the ground, is well worth trying. He showed fair novice form against decent sorts at Ascot last season, and when third over an extended 2m2f in handicap company in soft ground at Exeter last December, but his pedigree suggests this trip may well suit him better. He is a Shirocco half-brother to last year's leading staying novice hurdler Santini, and I remember a certain Thistlecrack doing rather well when stepped up a mile in one hit for this owner/trainer combination, going straight from an Imperial Cup fifth over 2m to a 3m Grade 1 win at Aintree. Furthermore, he has been dropped 3lb since Cheltenham and he was rated 7lb higher than this after that Exeter third - after he which he did well when chasing home the smart Whatswrongwithyou here in February - and I am also hanging my chapeau on this greater stamina test bringing out a lot of improvement in him. It is interesting that Colin Tizzard is giving him another spin over hurdles, as he said in an interview earlier this month that his 5yo was going to go novice chasing after the Cheltenham pipe-owner. Presumably he saw untapped hurdling promise in that run, too. Rockpoint is predictably priced up as one of the outsiders, but he certainly rates a bet at [18.0] or bigger on the exchange. 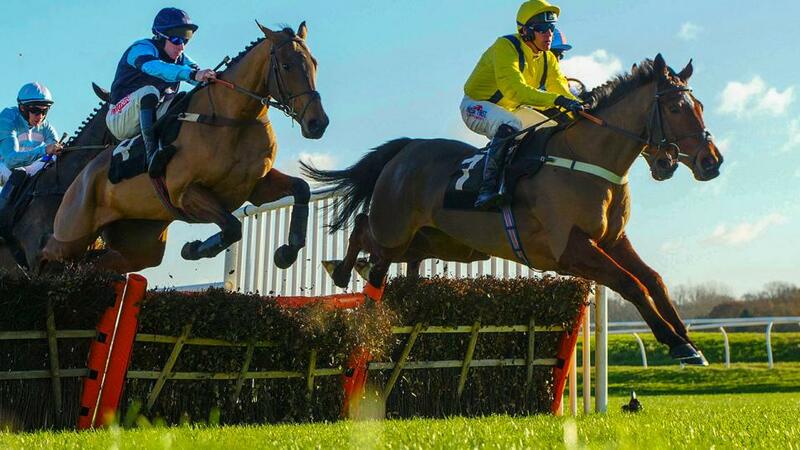 I thought Bobo Mac would give a good account of himself in the old fixed brush hurdle at Haydock last Saturday but connections pulled him out due to the drying, good ground there. Their patience has been rewarded with rain this week, and Bobo Mac looks primed to go well. He was very nearly a second play in the race for me, but I was hoping for a bigger price, given the depth of this handicap, with the Betfair Sportsbook (who are offering four places on the race) looking to keep him onside at 7/1. I can fully see the case for him. He was wearing first-time cheekpieces when notching up a 25/1 success on his final start at Warwick last season, but the headgear was left off on his return at this course three weeks ago, his first run after a summer wind op. But he ran a stormer at 33/1 to be beaten just 4 lengths by Jersey Bean, and the winner is now rated 15lb higher after a good subsequent second at Market Rasen. The well-fancied Ladbrokes Trophy runner Dingo Dollar was back in fourth. That means Bobo Mac still looks fairly handicapped here off a 4lb higher mark, and the cheekpieces are back on, too. A four-runner Grade 2 Novices' Chase at 13:50, kicks off proceedings on ITV4 and it's obviously a cracking little heat. But there is no point pretending that it excites me as a betting heat. Because it doesn't. Good luck if you think otherwise. The handicap chase at 14:25, is a bit more like it and it sees the return of the 2017 Neptune winner Willoughby Court, fresh from a wind op and recovered from a cut that saw his intended reappearance at Carlisle earlier in the month shelved. He undoubtedly has the talent to win this off a mark of 151, and his best chasing effort came when he beat Yanworth over course and distance at this meeting last season, but this is a competitive little heat, for all that he faces only six rivals. I would actually have King's Odyssey vying for favouritism with him after an excellent comeback second at Aintree, and a 2lb rise for that run looks fair enough. He was no match for an on-song War Sound there but they pulled a mile clear of the third and the softer ground here will be no hardship. However, with the likes of the progressive pair of Beggars Wishes and Touch Kick in the field and Ballyboley down to an attractive mark, I can leave the race alone. I don't have any argument with the way that the Grade 2 hurdle at 15:00 is priced up, with the form horses Sam Spinner and Wholestone both carrying a 6lb penalty and levelling the playing field. The unpenalised Unowhatimeanharry may have something to say about that "form horse" comment, in his first-time cheekpieces and on his second start after his wind op, and his trainer Harry Fry also saddles Momella here on her debut for the stable. To be honest, I am surprised the mare lines up, given that she could have run in a handicap here on Saturday off a mark of just 142, but someone clearly thinks she could be a lot better than that mark, especially after a wind op. But I will just stick to my two handicap plays in the last. Back tomorrow with a meatier column, no doubt. Good luck in the meantime.